Summary: Lara Jean’s love life goes from imaginary to out of control in this heartfelt novel from the New York Times bestselling author of The Summer I Turned Pretty series. Review: Romantic comedies can be hit-or-miss for me, especially since my threshold for secondhand embarrassment is pretty low. (And, oh, there are parts of this books that are downright mortifying.) However, I’m happy to report that To All the Boys I’ve Loved Before was definitely a hit. Our heroine, Lara Jean, not only has to deal with than the nightmare scenario of her love letters getting sent out, but she also has to figure out how to step into her older sister’s shoes when Margot goes off to college in Scotland. Their mother died when they were younger, and Margot ended up filling in that slot. Lara Jean’s struggle to live up to the standards Margot set for the family—cooking; getting their younger sister, Kitty, to swim meets and school; taking care of Thanksgiving dinner; etc.—is one of my favorite parts of the book. Lara Jean misses her sister fiercely, but there’s also a bit of resentment lurking under the surface since Margot was just so good at everything. Once you add in the fact that Margot’s boyfriend, Josh, is one of the boys Lara Jean wrote a letter to, things get complicated fast. In fact, the relationships between the sisters are one of the main highlights of the book for me. Jenny Han does a great job of showing how close the girls are while also exploring how distance, teasing, and growing up can strain those relationships. The loss of their mother casts a long shadow in the book, from small things like Lara Jean not being able to make a Korean dish taste like it did when her mother made it to larger things like how the family dropped a huge Christmas tradition after her death. I haven’t read many YA books that dealt with the death of a parent in such a down-to-earth, we’ve-gotten-used-to-it sort of way, but Han handled the topic well. It’s extremely difficult to talk about the romantic plots in To All the Boys I’ve Loved Before without spoiling everything, so I’ll only talk about it in broad terms: it’s messy. Really messy. 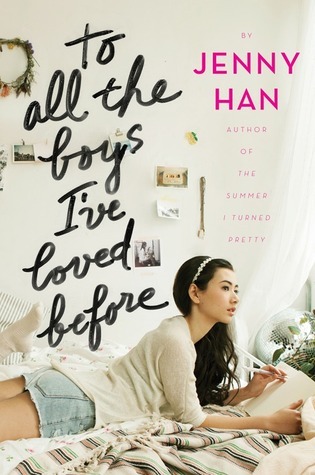 Things aren’t tied off in a neat bow at the end, which I appreciated, mostly because I was more interested in Lara Jean than any of the boys she’d loved before (or loves now). While the romance is certainly one of the most dramatic elements of the story, what’s really central to the book is how Lara Jean grows up and figures out more about who she is. Recommendation: Get it soon. To All the Boys I’ve Loved Before is a fun, fast read that strikes a nice balance between the romantic plotline and the family dynamics/drama. It would be a great poolside or beachside read this summer, especially if you enjoy sisterhood stories as much as you enjoy complicated and messy romances. I’ll have to keep an eye out for Jenny Han’s works in the future. I’ve really been wanting to pick this one up! I also heard that Han’s The Summer I Turned Pretty series is absolutely fantastic!